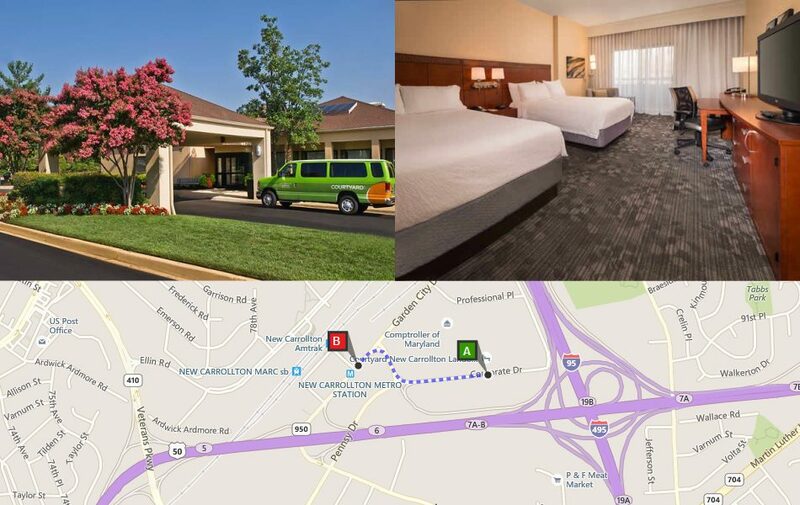 There is only one hotel within walking distance to the New Carrollton Metro and that is the Courtyard Marriott. This is one of more popular hotels on this website because it is the ideal hotel and location if you happen to be flying into Washington, DC form BWI. Online reviews will point out that the hotel was nice, updated, and comfortable. On weekdays rates are less than what you would pay to stay closer to the city or in downtown DC. On weekends traveler might want to look elsewhere as better deals come up closer to the city. The hotel is positioned right off I-95, and you can board the MARC and Amtrak without using a car. One of the drawbacks is that the hotel is location in and office park without any options for restaurants. Some travelers used the hotel so that they could be close to Fedex Field. If you don’t mind a 30 minute Metro ride into the city this is an excellent choice that will please most any travelers for the free parking, access to BWI, modest rates and brand name experience. What New Carrollton Hotel is Right for You? If the Courtyard Marriott is sold out there are other hotels within the area, but these will require that you drive to the Metro station, or use a hotel shuttle. At the New Carrollton station there are 97 metered spaces and parking is $5.00 per day. Use the widget below to find hotel deals near New Carrollton. Is New Carrollton Right for You? New Carrollton Neighborhood: New Carrollton is a suburban area located in Maryland at the end of the orange metro line. It is also located on the Amtrak and MARC train routes making it an ideal spot between BWI and downtown Washington, DC. This is a commuter town populated with families and older professionals. While New Carrollton is safe town, there is not much to distinguish it from other suburbs. The area around the metro and the hotels in New Carrollton are mostly office park and strip mall type places. This location is a good bet for visitors who don’t mind being removed from the city and who don’t mind staying in a generic area get free parking a nice hotel and commute into the city. Neighborhood Vibe: New Carrollton is a suburban area located in Maryland at the end of the orange metro line. It is also located on the Amtrak and MARC train routes. This is a commuter town populated with families and older professionals. While New Carrollton is safe town, there is not much to distinguish it from other suburbs. The area around the metro and the hotels in New Carrollton are mostly office park and strip mall type places. You’ll mainly find national chains in the area for dining, such as IHOP and Stonefish Grill. Things to Do: New Carrollton is a convenient metro ride into DC. It is also convenient to FedEx Field, home to the Washington Redskins, and the University of Maryland at College Park. Lake Artemesia is nearby and boasts fishing piers and hiking trails.